Ownership / Access: Belgium State. Notes: Bouchout Castle (Dutch: Kasteel van Bouchout) is a castle in the Flemish town of Meise, Belgium. In the 12th century, this territory of the young Duchy of Brabant was strategically positioned between the County of Flanders and the Berthout family, lords of Grimbergen. Most likely, the first fortification was built by Wouter van Craaynem at the end of the Grimbergen Wars (1150–1170). Bouchout Castle is situated at an altitude of 32 meters. At about 1300, the Donjon tower of Bouchout Castle was erected by Daniel van Bouchout, a knight who fought gloriously at the Battle of Worringen. In the 15th and 16th century, Bouchout Castle was owned by the Van der Marck and Transylvan families. The castle fell into disrepair due to lack of maintenance, while the Spanish dominance and the iconoclastic fury further worsened its condition. The first major renovation was performed by Christoffel d'Assonville at about 1600. 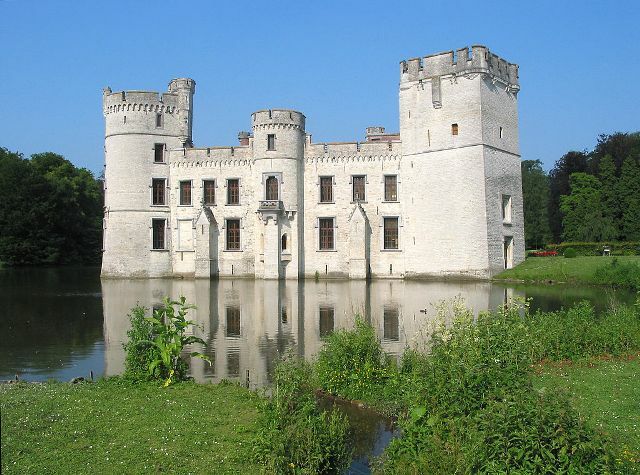 The rectangular medieval Bouchout Castle was surrounded by a large pond and could only be reached by a long drawbridge. At the end of the 17th century, Peter-Ferdinand Roose transformed the castle into a Renaissance "Chateau de Bouchout", surrounded with French ornamental gardens. Unfortunately, the castle was partly destroyed during the French Revolution period (1800–1830). Again, the castle was restored in 1832 by count Amadeus de Beauffort, who gave Bouchout Castle its current Neo-Gothic appearance. From 1879 until 1927, Empress Charlotte of Mexico lived at the Bouchout Domain. Her husband Emperor Maximilian I was executed by Mexican republicans in 1867. Thereafter Charlotte lead a secluded life at Bouchout Castle. Since 1939, the Bouchout Domain has developed into the National Botanic Garden of Belgium. Since the last renovation of 1987–1989, the castle and its rooms are now being used for meetings, lectures and exhibitions.